The effective and long-lasting seamless gutters offered by Advantage Roofing & Home Exteriors will better protect your home from water damage than traditional gutter systems will, as they are built without seams. 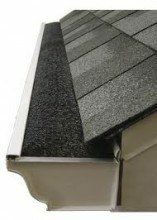 Standard gutters are typically sheets of metal pieced together with fasteners or similar hardware. The seams in between the sheets of metal provide the perfect opportunity for rainwater and snowmelt to leak through, which can result in unsightly stains on your home’s exterior, as well as more serious issues. For instance, water leaking from the system could pool around your home, leading to structural damage. And, when you turn to Advantage Roofing & Home Exteriors for your seamless gutters, you can look forward to partnering with dedicated professionals who can take care of the entire installation for you. Our commitment to excellence has helped us earn a number of accolades throughout the years, including an A+ rating with the Better Business Bureau. Do you want to learn more about the seamless gutters we offer to homeowners in the Cincinnati, OH, area? If so, contact Advantage Roofing & Home Exteriors today. We’ll be happy to answer any questions you have and speak with you further about why we are the area’s most trusted, reliable, and recommended home improvement contractors.